1) Specify “F” for Flat and “T” for Twisted when ordering. 2) Fastener values are based on a minimum of 11/2” thick wood members. 3) *Indicates no. 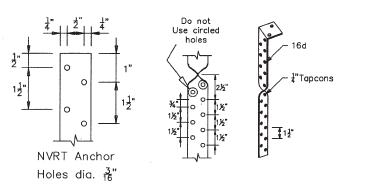 of nails in each connected wood member. 4) ITW tapcons shall be embedded a minimum of 11/4” into concrete tiebeam or tiebeam formed with concrete filled masonry. ITW tapcons shall have a min. edge distance of 21/2” and minimum staggered spacing of 3/4” as shown.